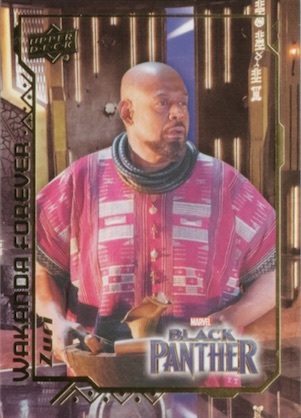 Already one of the best-reviewed Marvel films in history, the heroes of Wakanda take the leap to cardboard with 2018 Upper Deck Black Panther movie trading cards. Operating in the Marvel Cinematic Universe, the blockbuster is set around T'Challa (a.k.a. Black Panther), played by Chadwick Boseman. The main story picks up after the events of Captain America: Civil War, which also has a UD card set. Collectors can expect one premium hit, two memorabilia cards, and multiple inserts and parallels in every Hobby box. 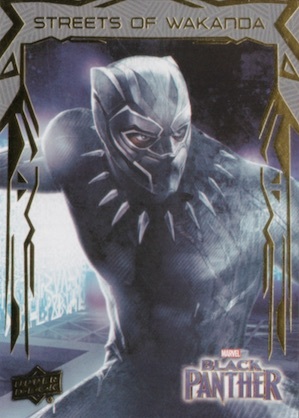 Offering the excitement from King T'Challa alongside his friends and enemies, the 90-card Black Panther base set highlights the film's plot using big-screen images. There are also three foil parallels, with the Photochromic version limited to 50 copies. In addition, Clear acetate cards should fall at least one per box. 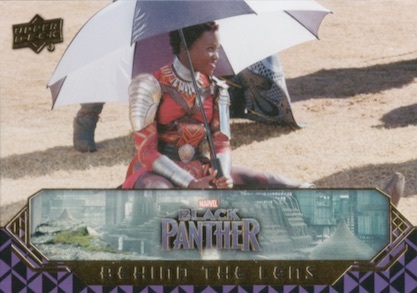 Combining with parallels to average one per pack, the 2018 Upper Deck Black Panther inserts include four themed sets, such as Behind the Lens and Wakanda Forever. Used to produce the base set and many of the inserts, one-of-one Printing Plates are also an option. 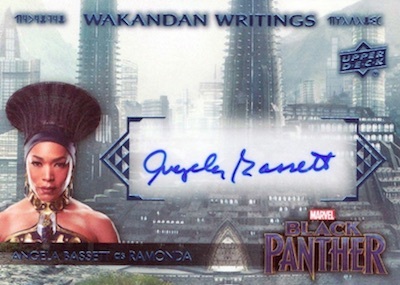 The big-ticket item in the 2018 Upper Deck Black Panther checklist, actor signatures come via Single or Dual Autographs. Even more limited, Autograph Relic cards are a case hit. As some may know, Vibranium is an alien metal used to manufacture advanced technology, including Captain America's shield. 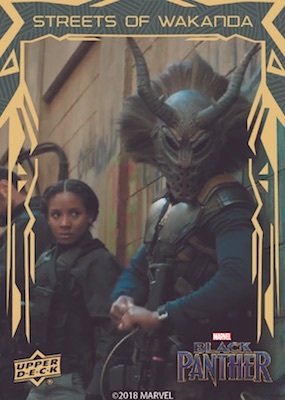 It is also a major component of the Wakandan society, albeit in secret. 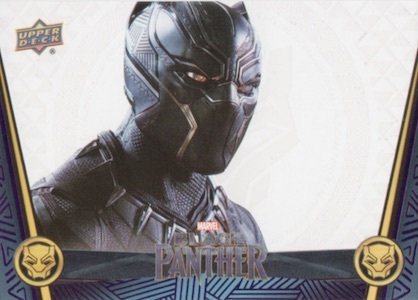 In 2018 Upper Deck Black Panther, the Vibranium cards are printed on metal stock to achieve a striking look and feel. 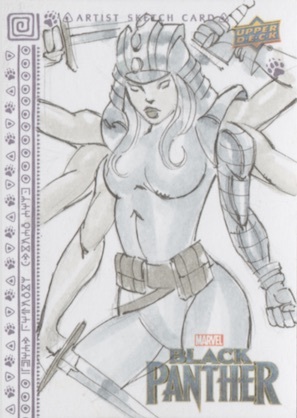 Another high-end possibility, various artist interpretations for key subjects are found on the hand-drawn Sketch cards. In each Hobby box, autographs, Vibranium cards and sketch cards combine to deliver one premium hit. Every box also includes one Single Memorabilia card and one Multi Memorabilia card. These feature pieces from items used in the making of the film. 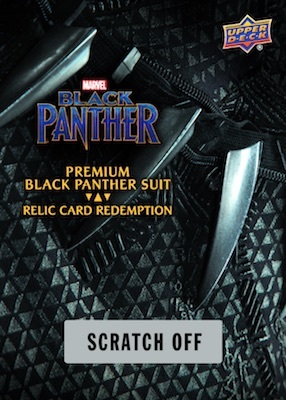 There are also special redemptions featuring pieces of the actual Black Panther suit. All odds below apply to Hobby (h) and ePack (e) formats. PARALLEL CARDS: Silver Foil (1:2.5), Acetate (1:16), Black Foil #/149, Photochromic Indigo #/50, Gold Acetate #/10. 47 What Do You Know About Wakanda? 7 cards. Overall odds - 1:60 packs. Shop autographs on eBay. 3 cards. Overall odds - 1:240 packs. 14 cards. Overall odds - 1:20 packs. 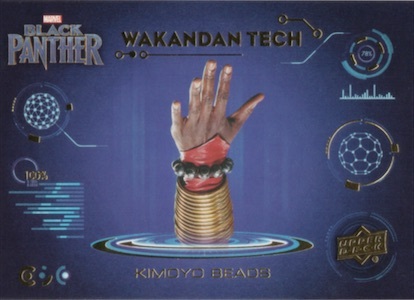 Features various pieces from the full Black Panther suit. Good: Designs really pop; awesome memorabilia selection; great overall collecting experience. 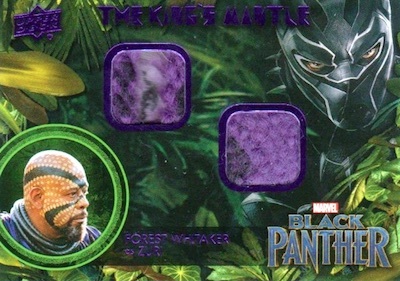 Bad: Signers list is very small; Vibranium metal insert can be the main box hit; box price is pretty steep. 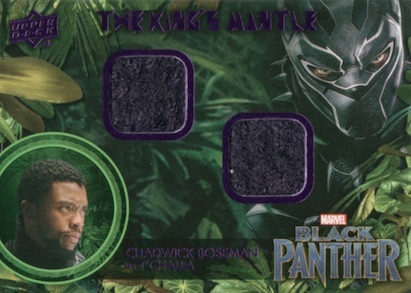 The Bottom Line: 2018 Upper Deck Black Panther can be tricky to size up because the cards look great but the tiny autograph checklist removes much of the purchase incentive for many collectors. However, the premium Black Panther Suit redemptions are an awesome addition that could entice those still on the fence to try their luck. 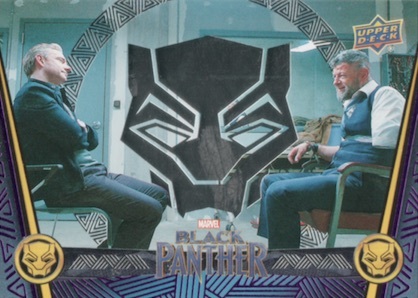 The design is a clear strength of the 2018 Upper Deck Black Panther movie set. Normally, the frame would be more of a distraction in my eyes, but I like what it adds to the base set and appreciate the purple foil accents. I also enjoy the way the parallels were handled. In my option, the purple-heavy frame would have been ruined by a mix of other colors to denote parallels, and I think the decision to stick with just silver and black foil logo options, plus acetate, which is another strong choice, was a great decision. I really enjoyed the Photochromic version that has a subtle embossed effect and changes color when exposed to UV light. The inserts stand out nicely from the base cards thanks to the gold foil in the design. I can't say that one really jumps out at me, but I like the variety they offer. I will admit that although I have no issue with the dense jungle design on The King's Mantle memorabilia cards, it is harder to make out the details of the cards except in direct light. 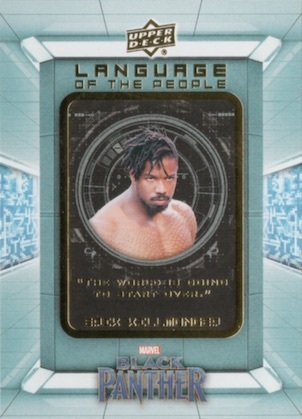 The more futuristic design contrast of the Wakandan Writings set was a very good decision in spite of the continued reliance on sticker autographs. 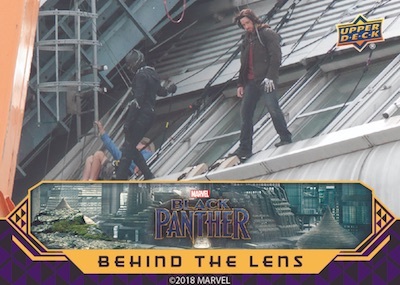 As one of the biggest movies of 2018, there was considerable excitement for the set. And when the final autograph list was announced, there was considerable disappointment. It's not that the lineup is bad, per se, it's just that it's only three subjects. All three are strong names, but none are among the main characters that collectors wanted or expected to see. That does hurt the set as a whole. Upper Deck did do a great job trying to offset this negative by going deeper with the memorabilia. 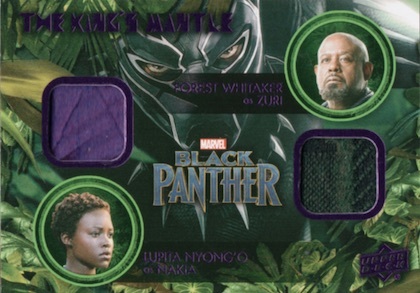 Specifically, the Premium Black Panther Suit Relic Card Redemption that features actual pieces from the title character's movie suit. It would have been nice if UD provided the packs odds for those as it appears they are very tough to pull. Despite initially coming in over $100 per box, prices sit in the $70-90 range at the time of this review. UD Entertainment releases tend to fall on the higher side but the key chase is quite rare and that is a tough price to work with by the box and still see value. This is especially true when a metal card counts as a box hit. 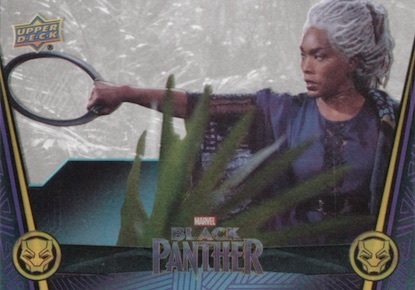 I had a fun time with 2018 Upper Deck Black Panther. So much variety comes in a box and it does a good job tying in multiple aspects of the film in a creative way. Sure, the autograph list is not ideal, but the collector in me was still impressed by what I came across. Any info as yet on who has signed for the product? Are there really only three signers for this set or has someone made a mistake. Only seeing Bassett, Freeman and Kasumba in various combinations. I think that’s the final lineup but I will update it if we hear otherwise from UD. No Panther suit redemptions pulled listed for sale anywhere yet. Wouldn’t be surprised if Upper Deck shafted physical buyers and saved them for epacks. FOR THAT PRICE IT SHOULD BE REAL VIBRANIUM!!!!!!!!!!!!! There was one redemption that sold on ebay. That is the only one I have seen so far. Three signers.. enough said.. waste of money. Totally agree it is just a waste of money. 3 signers that is not an A lister and at the same time Extremely Hard to Get. Most buyers would just wait when Black Panther is actually in the product that sells Black Panther.